The week before last the Green Market moved to their winter location at the north-east corner of the Peggy Notebaert Nature Museum. I had only gone once in the few weeks prior, and I have never been to the market past October, so I was curious to see what was there and so off I went. Onions, turnips, carrots, peppers, greens, still some tomatoes, and squash. Lots of squash, in fact. Many different kinds of squash. I had already experimented with Carnival squash and my pumpkin, and I had no specific intent to buy any squash, but there were so many colorful varieties in every size and shape imaginable that I had to bring some home with me. 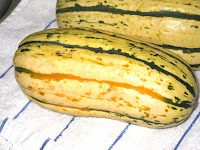 The lucky winner was an heirloom variety called Delicata. These were about 4 inches wide and 7 inches long. 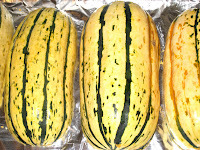 They looked like they would be relatively easy to cut (something I am learning to pay attention to when I am considering bringing squash home with me - I almost broke my knife on the carnival squash because I was so afraid it would slip and slice my hand open), and with a name like Delicata they were sure to be sweet and tasty, right? They weren't too hard to cut open. I sliced them in half lengthwise so I could get at the seeds. They weren't too hard to get out. After my recent success with the pumpkin seeds I decided I would take a stab at roasting these seeds as well. They were more round and slightly thicker than the pepitas. Mary told me her family used to soak their seeds in salt water overnight before roasting them. This made a lot of sense to me so I soaked the seeds, then let them dry for most of the next day, and roasted them in the evening. They were delicious. I will never throw another squash seed away. I placed the squash, cut side down, on a foil-lined cookie tray (one with a lip), and roasted it in a 350 deg. F. oven for 30-40 minutes, until it gave easily when I poked it with my finger (carefully, so as not to burn my finger). Most recipes for squash call for butter and brown sugar, or some form of fat and sugar, but after taking a little taste when it came out of the oven I decided it didn't need anything. These little squashes live up their name - they are soft and delicate and super sweet all on their own. 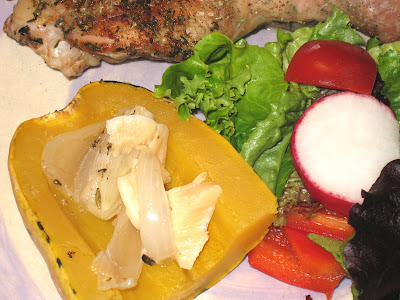 I only put the onions and garlic I had roasted under the chicken because they were there, and I ended up kind of eating them out of the squash and then eating the squash by itself. And not only are they sweet and delicate, they are dense and creamy. My favorite so far. 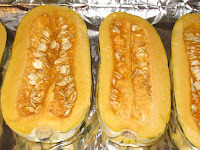 If you are nervous about cooking squash, let me tell you nothing can be easier. The method I've described above can be used for just about any kind: split it, take out the seeds, lay it cut side down, and bake until it's soft. Afterwords you can eat it as is out of the skin or peel it and mash it with a little oil/butter and seasonings.